Giant rats, dwarf elephants and hobbits – those are the keywords that I remember first when thinking about this collection of essays by Tim Flannery. Some of the essays describe his expeditions to find out more about certain species of mammals that live in Australia or New Guinea. Animals… living in a small city (or a village, as called by my charming boyfriend who ‘s from a city with almost as many inhabitants as my whole country does) I rarely come across any other animals besides cats and the horrible bicyclist-for-dinner-“he-wont-bite”-dogs, you tend to forget that some places in the world actually have more animal species than those two. Even I see some, but rarely, when I happen to be out late, and see a fox or a rare rabbit cross the road, even rarer are sightings of roe deers and other animals I see so rarely that I haven’t even had to look up their names in English. Where I’m trying to get at, is that animals don’t usually cross my mind (with the exception of dogs at night-time…brr), so Flannery’s descriptions of different animal species, who obviously live far-far away, are an interesting view into wilderness. Also who wouldn’t want to find out about the giant rats that inhabit some islands of New Guinea, or fruit bats, tree kangaroos and other creatures. Climate change is another theme that creeps up in this collection quite a lot, and with it using renewable energy sources such as solar and wind energy. A lot of these essays might probably be best appreciated by Australians, as they are mostly based on Flannery’s life and experiences there. However some can be appreciated also by others. What I liked about this book, was that it makes you think more about the environment in which you live (and Australia is similar to Estonia in it’s energy policy, as most of electricity here is also produced in plants using coal). Some of the writings that I liked best were Flannery’s book reviews, as they made me want to read those books, since his descriptions were exciting and in-depth views of the topic. 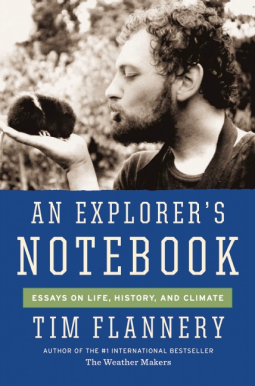 This entry was posted in Non-fiction and tagged An Explorer's Notebook, book review, Tim Flannery. Bookmark the permalink.